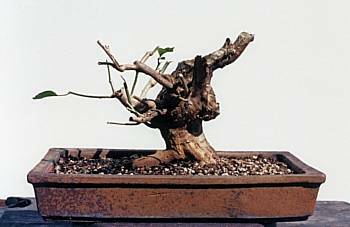 Thirty years ago, I fell in love with the art of bonsai. I bought a few trees and they didn't die. I owned a pine, a couple of junipers, and a liquid amber. 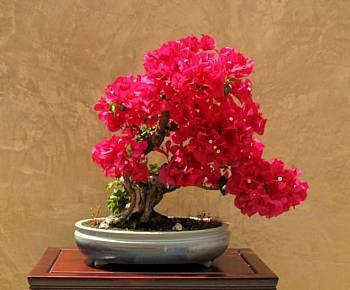 Then one day I saw the most beautiful bonsai ever — a red-flowering, slant-style bougainvillea in a blue pot. It was more than two feet tall and in full bloom. When purchasing real estate, the mantra is “location, location, location.” The same should be said for purchasing bonsai. 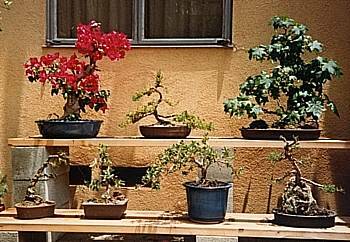 Buyer beware — don't collect bonsai if you live in an apartment. I was naïve to think a few trees in the parking lot behind my apartment were safe. One day, about twenty-five years ago, I went outside to find one tree missing. A neighbor saw my distress and asked what was wrong. When I told her, she inquired if the missing bonsai had been in a blue pot. It seems her boyfriend had liked the pot as much as I did. He yanked the tree out of the pot and threw the bougainvillea in a trash can half a block away. Then he washed the pot and put it in his apartment. Within twenty minutes, he returned both to me. About a week later, my neighbor threw her boyfriend away. The tree had been in the trash can for probably five hours on a hot, sunny day. Adding insult to injury: most of the roots had been ripped off when the tree parted ways with the pot. The bougainvillea was reunited with its pot, but it was never the same. The tree was weak and suffered some dieback. It would occasionally bloom, but only a few flowers here and there. 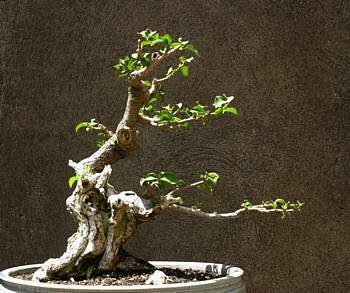 The more I learned about the art of bonsai, the less I thought of my flaw-filled bougainvillea. The trunk had reverse taper near the base. The lower right branch was small and aimed downward while the lower left branch was heading skyward. Above was a long expanse of thin, branch-less trunk before a red pom-pom exploded at the apex. The pot was a pretty color, but cheap. A year later, my husband and I purchased a home, and I installed an eight-foot-tall fence in the back yard to protect my trees from intruders. But a fence couldn't protect a cold-sensitive tree from a week-long deep freeze (the coldest temperatures in more than a century) that blanketed California in December, 1990. I threw a towel over the tree on the second night of the freeze, but it was too late. 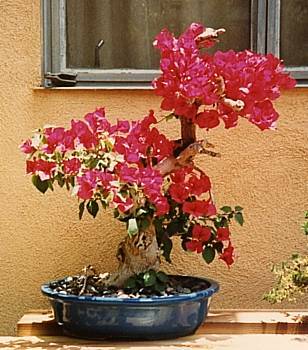 My two-foot tall-bougainvillea was now a four-inch branchless stump. The original front of the trunk had died back to the soil level. 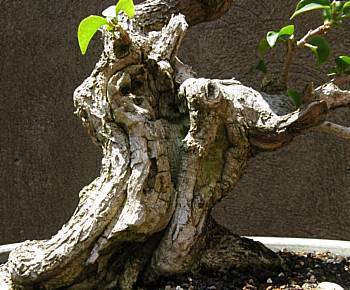 There wasn't much left of this not-so-great tree, so it was relegated to the back of my bonsai garden. John Naka would put sick or small trees in the ground to restore health and maximize growth. If a tree ever needed that treatment, it was my frozen bonsicle. I followed John's advice and sank the tree into a raised bed. 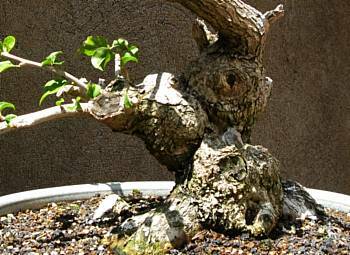 After a couple of years, a few branches kept emerging from the same area of the trunk, exacerbating the reverse taper. Back in the ground it went for several more years. Many branches began to emerge from the base of the trunk to thicken it and the rootage. Before they got too big, they were removed and the cuts healed over. The bark on the trunk had aged nicely. I thought the old back would become the new front. But after about fifteen years, something wonderful happened. Much of the soft wood of the dead trunk melted away, and the live wood rolled over the shari. The undulating life line exuded age and character, so the original front was restored. The tree has finally regained its health, and a new trunkline is growing. Although the tree is only half the original height, it still slants to the right. The original pot has been swapped for a very beautiful hand-thrown, blue-glazed pot. Future refinement will include more branch development (especially on the left side) and four to six more inches of height. Being trashed and frozen couldn't keep this little tree down. This spring, after nearly thirty years, the red-flowering bougainvillea bloomed like never before. It no longer needs to be hidden in the back of my bonsai garden. One of my first trees is now one of my favorites.